I was raised an Anglican but here in the US I go to a Baptist church. I like this church because it is informal, contemporary and very unconventional. It is called Horizon Community Church. 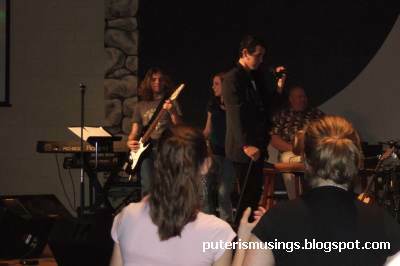 One Sunday, the youth worship team led by Pastor Tim himself, started playing Rolling Stones' Can't Get No Satisfaction. 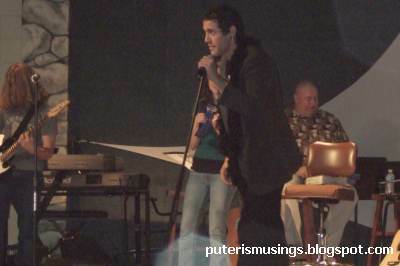 And a young singer, ran up the stage dressed in black and a feathered scarf and started belting out the song! There was much clapping and swaying from those in attendance. It was fun but at the end of the song, the singer inserted, "Where can I get satisfaction?" And that line was the lead in to the Pastor's message for the week. Last Sunday, the worship team played a gospel song to the tune of Bob Dylan's Knocking on Heaven's Door. It was a good presentation because the lyrics were based on the bible verse that talks about "knock and the door will be opened to you". There are several talented people attending Horizon, and we have at least 5 different worship teams. And as to the messages, they are always relevant and very bible based. The reason why Horizon is very informal is that it strives to be seeker-friendly. There are many who attend Sunday services who were never brought up in a Christian environment. And this brings me to the "discussion" that Guruh and I had over at his blog. :-) He was complaining about how, among the spam mail that he had received, were "preaching" from well-intentioned people. For me, any church that I worship in has to have Jesus at its core, and practises the true teachings of Jesus. Church traditions and rituals are secondary to me. Having said that, there are some church practises that I will not put up with, for example, praying to the saints or to Mary. When I was a college student, I attended a chinese-speaking Presbyterian Church. Heheh, there was interpretation, of course, and so the service was rather long. When Doug and I lived in Michigan for a time, we attended a Lutheran church. To this day, I am very impressed by Pastor Barry's teachings. What are the marks of a biblical church? Mark E. Dever points to six marks that a church must have to make it a biblical church. For a more thorough teaching of these six marks go here. no lah, I like spirited discussions, as long as you hold true to your convictions.